Just what does the “21st Century classroom” actually look like? Do you even know? What do you actually picture when you close your eyes and imagine? Does your classroom reflect this ideal? What is the divide between the ideal and the reality in your school or district? My district has an interesting embedded program known as Crayons to Computers. A significant chunk of space is devoted to warehousing and categorizing materials donated from businesses and individuals that might have otherwise ended up in a local landfill. While seemingly little more than a room of junk to the uninitiated visitor, in the hands and mind of a creative teacher, this program can be a godsend. From notebooks, pencils, and crayons to beakers, books, and computers, this nifty little depot often has just what the resourceful teacher needs to complete a classroom project. And perhaps even more importantly, every single instructional use of these items helps to turn a portion of the community’s refuse into educational treasures. This past August, in the midst of our “New Teacher Institute” in the days before school started, the district’s instructional coaches took our bright eyed new hires on a tour of some of the more crucial components of daily operation in our world. Sandwiched between mini-seminars on best practices, practical tours and nuts & bolts introductions done to help acclimatize our new blood to their new surroundings. One stop along the way was C2C. That day, while new teachers perused the bins, boxes, and shelves of our depository of donated items, I decided to play along. Longtime teachers have had years to collect resources and to craft an environment for learning to their liking. However, to early service teachers -with far less time under their belt- this storeroom is a place to stock up on consumables among other things. In a town that battles significant socioeconomic stressors, this storeroom is celebrated by many. I picked up one item to keep that morning. While rifling through a poster bin with one of my former students -now a biology teacher- I found a… what might be the opposite of gem? Turd, you say? Ok- fine by me, let’s go with that. 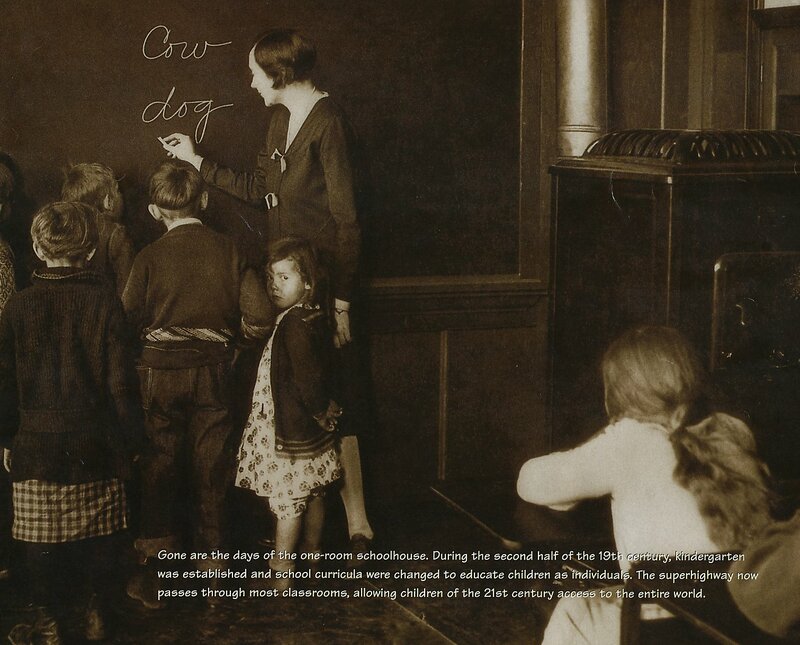 Gone are the days of the one-room schoolhouse. During the second half of the 19th Century, kindergarten was established and school criteria were changed to educate children as individuals. The superhighway now passes through most classrooms, allowing children of the 21st Century access to the entire world. Now there’s a sentiment worth repeating… reform. Change in what we do. Change in the tools, the access and thus the mission of our schools. Access to a potential global perspective. Who doesn’t believe in this as a good thing? In fact, such a change in access, coupled with reform, should produce profound differences within the classroom. Right? Now study the poster. What exactly are the differences depicted here? The inset image should show the shift in reality in our schools. Does it? What is really different here? Where is evidence of a change in curriculum? Where is the evidence of the “superhighway?” Which classroom is more inspiring? Which is warmer? Which is more engaging? Which is more teacher directed? Which is……….. Funny stuff, huh? I thank those who have come before me in our district. We have been blessed with a robust pipeline of digital data since before we knew what to do with it. Though we are still mere babes in the woods of the read/write web, we are beginning to establish a long-range study and planning group. We recognize the realities of a world that is changing faster than we can even measure. I am excited for the future of schools in our little Midwestern outpost where the Pony Express began. I’d like to think that we could recreate our vision and purpose along the same lines as this historical entity. I would love to think that we could envision our local schools as the starting point for an epic journey of learning through rigorous, and often unknown challenges. We might smirk at the poster mentioned above today, but are we planning to become the “Pony Express” of learning for the future -both locally as well as nationally? I certainly hope so. 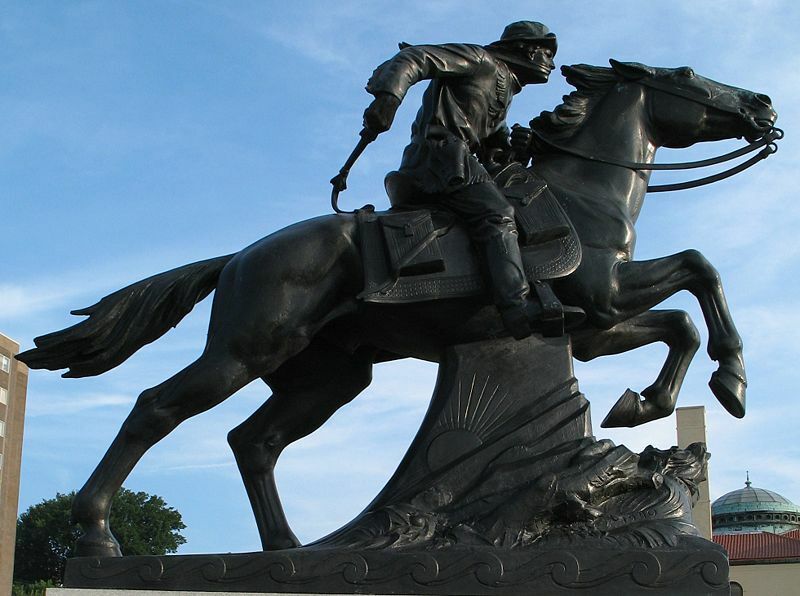 *Pony Express Statue by Americasroof as posted on Wikipedia. *School Supplies by Sergey Galyonkin on Flickr. Previous Article← The Educational Remix- At Odds With Copyright? First of all, you live where the pony express was started? That’s cool! You have got me thinking…what would someone see from my classroom? My school hosts visitors from around the country – around the world – multiple times a year. I’ve welcomed nearly 10 such visits from teachers/principals/superintendents to my classroom this year alone. I’m really wondering now what that snapshot in their minds of MY room, of MY teaching, looks like. @Jenny, I got an e-mail on this from a colleague today who mentioned how he thought a “snapshot” is never a valid piece of information. I think I agree that one might not be… but a series over time would constitute a form of objective data collection same as any scientific study. What would one image be worth? It is worth the sum total of that image in a marketing sense. I think one photo says a TON. It is just that we are so very careful about what that image might convey. Perhaps I should have asked commenters to post a link to a classroom image that they felt represented the pinnacle of interaction in their world. Now that might be interesting. I too agree that the old image is beautiful. Such a simple time in many ways, eh? The proximity in that one says a ton to me as well. It feels warm and safe to me. The other is just…. meh. And what no one has mentioned yet… where the heck is this superhighway (Internet) evidenced? The only evidence in the “new” image (aside from color) that it wasn’t taken the same day as the other might just be the plastic seats. Very… very odd marketing decision here. And hey- I wish I could visit too. Think you could arrange a little video conference of your class to pipe in with a group of elementary instructional coaches here? I bet we could share some really amazing things that way. Interesting? We’d both get to learn a ton of logistics as well. @nashworld, I would love for you to pop in virtually., Don’t know how to make it work, exactly, as our district blocks LIKE EVERYTHING! However, I’m willing to do a little research if you are willing to lend some knowledge. Wow, nashworld> very thought provoking content in your article. I love reading material that brings the past and present together. You certainly have a way of making a person think about education. I look at both pictures and see comparisons yet many differences with both. Both seem to be teacher driven yet the black and white shows very little student involvement. The one young student would rather look at the camera than focus on the spelling of words. Maybe she already knows how to spell cow and dog and that is why she is less engaged. On the other hand she may be intrigued by the camera. 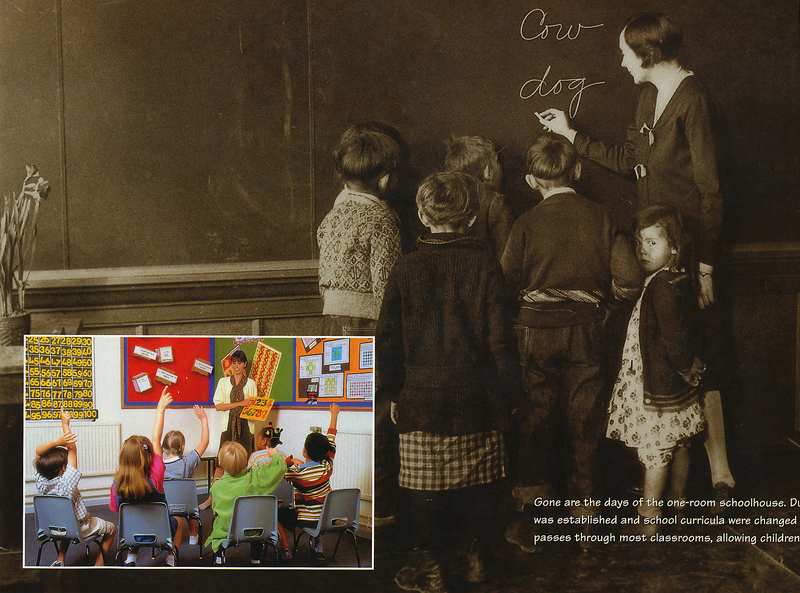 In those days, a camera and picture taking while in the classroom may not have been used that often. Why such a sad face though. Not a happy camper in my book. In my younger days it wasn’t that often we were not standing, but rather glued to our seats just listening to lecture. Even in the College years. As for the color picture that shows teacher directed learning, you do see much more student involvement just by the show of hands in the air. This is obvious that it is a math lesson, because numbers are being used. Young students are not aware of the photograph taken, but rather interested in pleasing the teacher, wanting to answer the question. Much more color and beauty in this photo. Your right, we have come along way from the dark ages of education. In fact this is the first time I have really responded to such an article. In order to move into the future of education we must learn from the past. History is important, along with traditions, and that makes us who we are. Educational change along with methods of teaching and learning have made learning more challenging for everyone. You never stop learning, just as you should always want to improve you learning abilities. Keep these articles coming as I am a fan of your thoughts and comments. Enjoy the reading. @Mziesel, “You certainly have a way of making a person think about education.” <= huge compliment, thank you. 😉 Thanks for posting a comment. It makes this largely white space assume much more depth and contrast- in more ways than one. I appreciate your careful examination of the photos. To me, there is much more beauty int he older image. For one it is just well-conceived photograph. But again, as I said above, the body language in this one draws me in. These kids seem more like brothers & sisters as opposed to the newer image. They seem more like individuals pining for attention. I also agree with what you said about the little tyke in the older image. But where, oh where, is this "info. superhighway" touted in the text? I see not one sliver of evidence. Very odd. As a sub, I have to really work to stay on top of all of the new technology. Plus, it’s different in every classroom. There are so many connections. When I close my eyes, I see thumbs going as fast as they can down an imaginary highway. Information is flying out in different directions. As an adult educator, it’s not quite the same. The adults I teach actually prefer the parts of the class where I am teaching and interacting with them moe than the parts supported by technology.